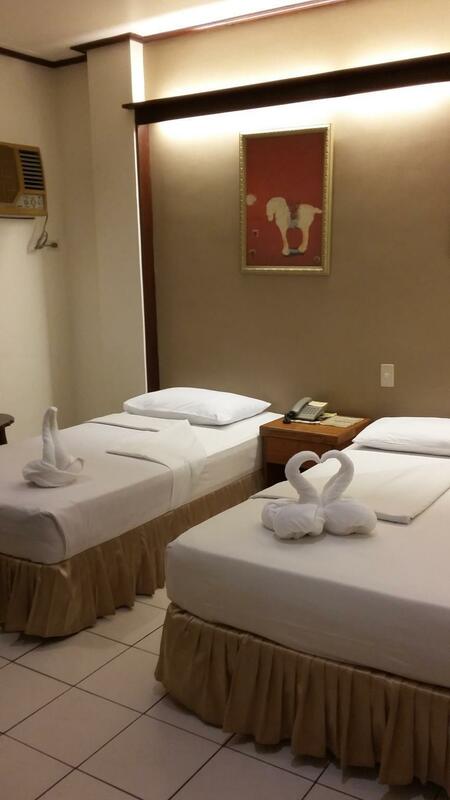 Ada pertanyaan untuk Dumaguete Royal Suite Inn? 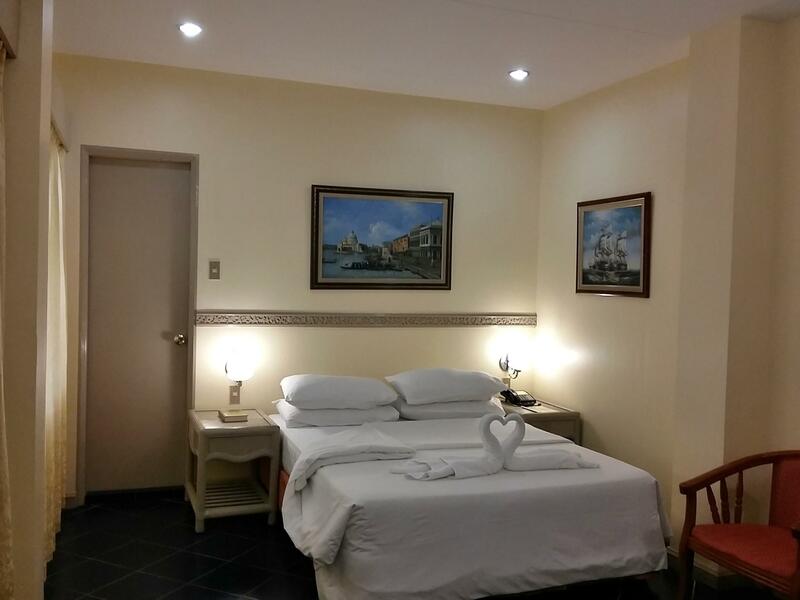 Direnovasi pada tahun 2017, Dumaguete Royal Suite Inn menjamin penginapan yang menyenangkan bagi para tamu di Dumaguete baik untuk tujuan bisnis maupun plesiran. Pusat kota terletak hanya sekitar dan bandara dapat ditempuh dalam waktu 10 menit. Yang tidak ketinggalan adalah akses mudah dari hotel ini ke sejumlah obyek wisata dan landmark kota ini seperti The Christmas House, Desa Sidlakan Negros, Klub Golf Angtay dan Driving Range. 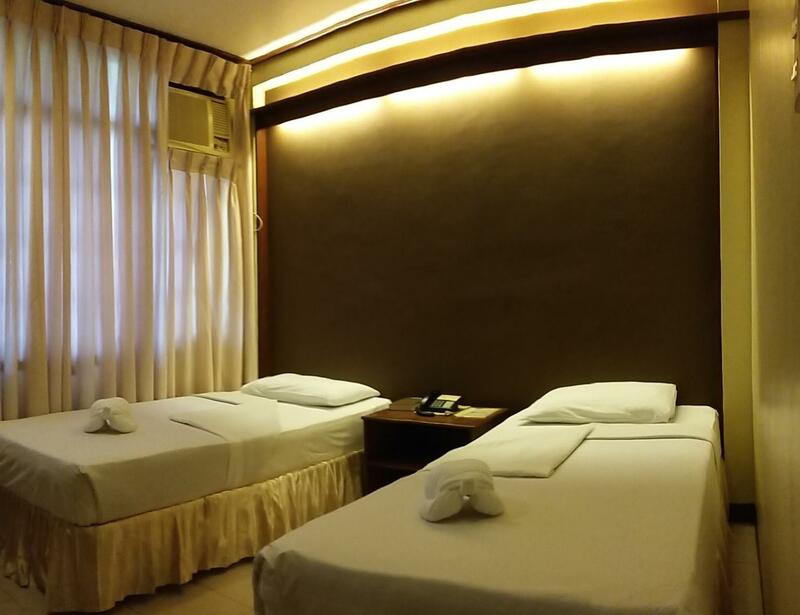 Dengan menawarkan pelayanan superior dan sejumlah fasilitas kepada para tamu hotel, Dumaguete Royal Suite Inn berkomitmen untuk memastikan penginapan Anda senyaman mungkin. Untuk kenyamanan para tamu, hotel ini menawarkan WiFi gratis di semua kamar, satpam 24 jam, layanan kebersihan harian, resepsionis 24 jam, Wi-fi di tempat umum. Suasana Dumaguete Royal Suite Inn tercermin di setiap kamarnya. akses internet - WiFi, kamar bebas asap rokok, AC, meja tulis, balkon/teras hanyalah beberapa dari fasilitas yang dapat Anda nikmati. Sepanjang hari Anda dapat menikmati suasana menenangkan dari pijat. Ketika Anda mencari penginapan yang nyaman di Dumaguete, jadikanlah Dumaguete Royal Suite Inn rumah Anda ketika Anda berlibur. Clean, friendly staff (although charging to print flight boarding passes does seem a little stingy). Good WiFi that worked well in the room. The place is currently undergoing renovations and when these are finished it will clearly be much slicker and more sophisticated. When we visited there last March 2018, we were surprised coz the Inn was under renovation. We were not informed about this after our booking was confirmed. Car parking slots were then limited (only 5 can fit in). No guarantee if you can still get a space when you get back to the Inn. It was quite inconvenient for us to travel around the place. We booked the Suite Room. It is spacious and clean with 2 rooms. Beds are comfortable with two bathroom, one with bath tub. Check in was fast and easy. The place was under renovation but it was fine, we had a wonderful stay with my friends. 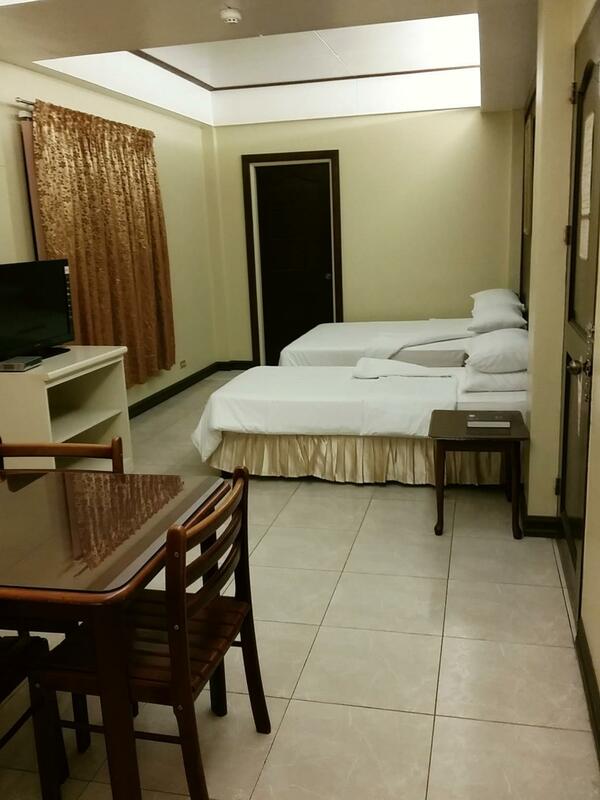 Quiet place to stay in Dumaguete; very near Airport and St Paul University; 5mins away from downtown or boulevard; hard to get tricycle/taxi during rush hour to get to hotel. All smiling and very friendly and helpful staff, day and night. 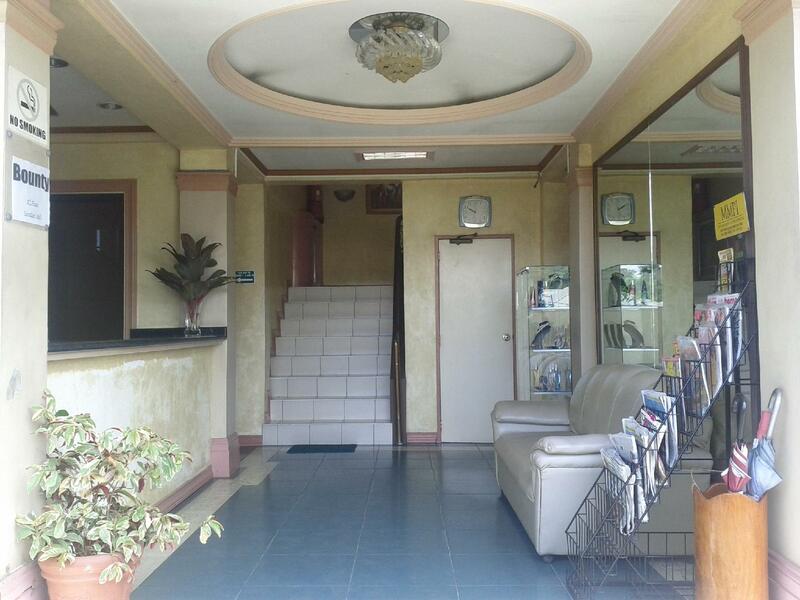 Basic and clean facilities; all working conditions; with aircon, TV w cable, shower w strong water pressure; wifi, but weak signal inside room. A bit far from the Boulevard which is the epicenter of Dumaguete life but other than that, the place is excellent. We got room 25 which is practically a 2 bedroom condo unit. 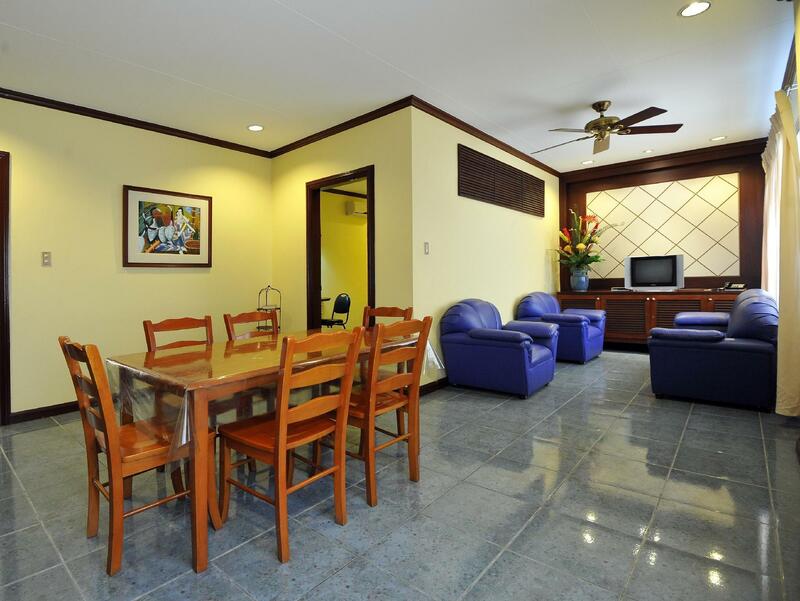 It has a spacious living room, dining room, 2 bedrooms (queen sized bed on one; 2 singles on the other). Each space has its own TV. 2 toilet and baths with one having a bathtub. It is located at the far end of the hotel and you will not be bothered by the street noise. Room is clean and while the living room has no airconditioning, turning the 2 bedroom aircons on with doors open can cool the living room somewhat. though our room was smaller than expected it was ok. A little issue on your restaurant staff. Nost of the time we need to order food or pay for iur food we had to look for the staff. I really dont mind but i guess you need to add more man power. I saw one person doing the order, waiting and even on the cash register. Old property that really needs renovation, however, didn't know during the time I booked that they are currently doing the renovation. Noise and at one point had power interruption for 2-3 hours. Not near the city center, bus terminal; however near to a mall & the airport. Due to the low rate and some good comments in agoda, booked for 2 nights. However, surprised that they were having some renovation/construction work. On our first day, we were tired due to traveling, they had power shut down and the construction work noise at the same time. Location wise as well, its not in the city center so some public tranport drivers were charging more than the minimum. good thing they are near to the airport and city mall. No toilet tissue in the room, internet runs about 1.5 MPBS download speed, first floor internet was out, was able to grab the 3rd floor. AC worked, plenty cool. Hot water in shower was fine. Rooms could use some painting. The restaurant was 3rd rate, though nice appearance. Toast was so dried out it could be broken by hand, would not bend. Despite that issue, no marg or butter served on it . Every food item was slightly warm, no food was hot, I was expecting at least one item to be hot, implying they let the other items sit and cool off while waiting to finish that one item. Alas, no, despite the wait, nothing was hot. Almost no Asian restaurants preheat plates, so the problem of food temperatures is almost always exacerbated. Asians do not really know about hot food. Out of coffee, but they did have hot water (the only truly hot item they had), so I at least had my own coffee, which was good. Moved closer to the tourist strip, and got a better experience down there. It is under renovation and badly needs it. It has a stinky musty smell in the room. Towel bar broken off. Air con is so noisy it sounds like a trick parked and running in your room. The towels and linens are very worn bot at least they were soft. The toilet had to be flushed 5 or 6 times to stop it from running. Worst of all... the door locks were a joke... mi security so I used the safe deposit at front desk as there are no room safes. When I went to get cash from my safe deposit it was open. They did not need my key or any key? Nothing was missing but this is where my passport and most money was. Never stay here. The staff was nice enough but had no answer for the security or stink in my room.... and there is no water to drink in this hotel. You must buy inflateted price water from the hotel resteraunt. Never stay here. This will be a good place to stay in Dumaguete but, if you intend to go right now don't due it. They are under renovations, lots of noise. Our bedroom was right beside and even at 4am we heard guys working. Just give them some time maybe in a months or two they finish and would be great! It is not the best location but not problem to get to the center. The restaurant serves good food and big portions. The breakfast it is also good if you take it there. The staff is great, very friendly on the check out the girl at reception even arrange for us a trycicle. Our room had no window. I mean thwre was a window but facing the wall in 20 cm. water in the shower was going down really slow. They are working on the building and I'm sure it will be better after a while. Staff was friendly and helpful. Upon arrival we discovered the TV did not work nor did the refrigerator. Called front desk and informed we should wait 1 hour. I went down to the front desk and discussed the poor service with them face to face. Another TV remote and frig arrived at our room in 10 minutes. The concept of wait 1 hour was to be a repeat the whole time we staid here. The room was a Junior Suite and was good sized. The water was hot except in the day time. The hotel seems to use all the hot water to wash sheets, towels, table cloths and staff uniforms. I asked about the lack of hot water one morning. I was told... "Wait one hour." I went down to the front desk and spoke with the staff. Was informed they would check my shower and the pipes. I know about plumbing. Explained it was the hot water heater. THEN the staff admitted they were using the hot water and would be finished by that evening. After a direct explanation of what service meant, the definition of hotel service, the water was hot. That took a good 5 minutes to accomplish. The breakfast was adequate and reasonably priced. NOT free. The place is under construction as advertised. The noise was minimal. The constant flow of seminars and events was far more disruptive than the construction noise. All in all... it's totally in line with 75% of the hotels in the Philippines. The concept of service is unknown to the staff. Smile and nod while looking at their shoes is all that you can expect unless you press the matter. I find, as a paying customer, having to press the matter is insulting. Came in a day earlier due to bad weather and they we nice to allocate us a room that we would stay in for both days instead of wanting us to change from one room to another. Wifi connection was bad! couldnt connect half the time. TV's reception was also bad. couldnt watch most of the time when we switch it on. They had limited supply of hairdryer. They had to call someone to borrow their hairdryer and subsequently called us to return them the hairdryer as someone else needed it too. It would be good to have more hairdryers for the hotel goers. Staff were really nice to help prepare our next day breakfast near midnight(sandwhiches which were yummy by the way) as we had a super early day tour to leave for. All tricycles knows every hotel in the island it seems, so it was really easy to travel to n fro the hotel. Our stay here was really good since we had no trouble regarding noise. Our sleeps went well and the staff were very informative about the places in dumaguete since we're not from the place. WiFi was fast and reliable. Stayed here with my young son and couldn't fault anything.The staff are genuinely friendly and helpful and it was certainly value for money. Nice powerful shower with hot water. Wall mounted flat screen TV.Quiet setting but only minutes from the town centre. And to top it all our own balcony. Would certainly recommend this to couples and families alike. I thoroughly enjoyed my stay at the Duma Royal Suites, the staff was very kind and attentive to my needs. It was clean, safe, and far enough from downtown to feel relaxed, but easy to leave via trike. The food was very good (especially the budbod & native chocolate breakfast). The room was simple but well-appointed. This is not a destination hotel, but quite comfortable for a traveler.